My grandmother made the mistake or gave me the good fortune (whatever way you look at it) of taking me to Florida during the winter months to visit her brother in St. Petersburg, Florida on a couple of occasions when I was still at Roosevelt Elementary school. With a directive from my teachers on homework I should being doing while out of school for an extended period of time, off I went with my grandmother, who was also my dearest friend in the world, on one of those old prop jets to Florida. Upon reaching Florida and getting off the plane, I was greeted by sunshine and warmth in the middle of winter. I was amazed and enthralled by the change of climate and I think that made me decide at a very young age that Florida was where I wanted to be. When I graduated from Mumford I had no idea of what I wanted to do with my life, but I did know I didn't want to do it in Michigan. So, within a little over a year of graduating Mumford and after a short stint at Detroit Business Institute, I decided to leave Michigan for Florida. Although it was a difficult thing to do, I left my steady boyfriend of 4 years behind in Michigan and took off on a Greyhound bus for a place in the sun. That was in March of 1962. Having no job and no place to stay at first, I started my new life. I moved into a cheap hotel on Collins Ave. in Miami Beach and started looking for a job. I ended up getting a job at Mt. Sinai Hospital doing clerical work. I had a ball living in Florida! Many of my friends were nurses and many of the guys I dated were interns and residents at the hospital. If any of you remember an old movie called the "Young Interns," starring Stephanie Powers (then a starlet and the same age as most of us, by the way), that was the way we partied. We had IV bottles filled with boose at the parties just like in that movie. I did a lot of partying with the nurses and doctors and when I wasn't partying or working, I was a beach bum. Many of my friends were Cuban, so I made use of the Spanish I learned from Mr. Madonna for two years at Mumford. I was living in Miami Beach during the Cuban Missile Crisis, talk about scary, being that close to Cuba. I was at Lincoln Mall in the now famous South Beach area the day word broke out that JFK had been shot. I traveled across country by Greyhound bus at age 19 by myself from Miami to San Francisco when they had a deal of $99.00 round trip anywhere in the U.S. It was a wonderful adventure, as I made many stops along the way in different states and went sightseeing and met some really interesting people. I also had the good fortune to room with classmate, Ruth Anne Jacob in Miami for about a year when she decided to move down to Florida. We had a great time together before she moved back to Michigan. I missed her a lot afterwards. After almost 4 years in Miami Beach, at the age of 21, I decided that it was time to do something with my life, careerwise. I knew I didn't want to do clerical work forever, so I decided to become a nurse, since so many of my friends and roommates in Florida were nurses. I couldn't afford to go to nursing school and take off work to do so living in Florida, so I headed back to Michigan to move back home only until I finished nursing school. I was going to immediately move back to Miami, but it didn't work out that way. I met my now ex-husband while attending Shapero School of Nursing at Sinai Hospital and got married shortly after graduation. Although I pleaded with him to move to Florida, he wouldn't do so. He had just been made partner in a law firm and didn't want to have to start all over again somewhere else, so Michigan it was and here I still am, much to my dismay. We were married for 10 years and had two wonderful sons. I only worked for a little over a year as a nurse in the first year of my marriage and I absolutely hated it! Then I became a stay at home mom for several years. Since nursing was the wrong profession for me, I had to find a different way to make a living to supplement my child support money. I began sharing my home with roommates to bring in extra income. I went to a roommate referral service to help me find a roommate on one occasion and ended up working there. I loved the business and thought that I could do a lot more with that type of business than my employer was doing with it, so I decided to start my own business. A friend of mine had recently lost her job and wanted to go into business with me, so in 1979 we started our business called Home-Mate Specialists. I handled all promotion and advertising for the business. She handled the financial part. Other than my children, that period was one of the chief highlights of my life. Through my efforts, we were featured on almost every local radio talk show and several top TV shows, including Kelly & Co, Good Morning Detroit and PM Magazine. We were also featured in many newspaper articles, including US News and World Report. I spoke at several different singles group meetings and was invited to speak at Madonna College on alternative lifestyles for seniors, regarding the benefits of sharing living quarters. It was the best of times and the worst of times. My partner refused to allow us to get a computer to help run the business more efficiently and so the matching up of roommates took hours and hours to do, instead of a few minutes if we had had a computer and the right software. I ended up living at the office, since she had a boyfriend and never worked overtime. Many times I worked until the wee hours of the morning doing things that could not be done during the day and sleeping on the couch at the office, only to begin again the next day. I couldn't take it any longer. I had no life out of work, so I left the business. It broke my heart because I had worked so hard at it for four years. Other than my kids, it was my life. It was almost like losing a child. I had a very brief and unfortunate second marriage with a man who was a hopeless alcoholic and then several years later met my now husband, Paul on the Internet, believe it or not! If you go into the URL below you will see our success story online. Look for the names: Paul Precour and Nancy Stanson. For many years now I have been in sales. You name it, I've sold it. I recently was laid off from the job I had where I sold remanufactured Nortel and Lucent telephone business systems. I will be starting a new career on Monday, July 16th and will be selling advertising specialty and promotional items. If any of you use them for your business, please give me a shot at it. I will need all the help I can get in this new venture. By the way, I have two wonderful sons, ages 32 and 28 and 2 1/2 grandchildren. P.S. It is difficult to abbreviate 40 years of life experiences, isn't it? I hope this isn't too long. If you knew Nancy at Mumford you understood fun. Then again at our 40th reunion she created the Mumford spirit by asking us to write about what had happened to us. 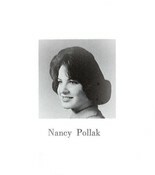 In effect, Nancy was the internet Queen that opened Class of "61" dialogue and remembrances. Our letters, addressed to "Dear Nancy" spoke directly to her as most started "Dear Nancy" then offered us a free forum. At the reunion she accepted recognition of her job well done with a gracious smile and simple thank you. She will be missed. I have not seen Nancy since our 40th reunion. I went with her to our gathering. I have always kept in touch with her and Carol told me this past week that she was not doing well. (Thank you Carol.) I got to talk to her several times last week and told her that I would see her at our next reunion. She definitely will be with us then. I miss our friendship of over 50 years. I still have her last voicemail message on my cell phone saying "hey Plotnik where are you?" Nancy's last outing was when we went to see Charlie Latimer and Ron Coden at O'Maras. I am so glad we did that. Nancy had a lot of spirit and loved life. She could not wait to go to the reunion. Her spirit will be there. She is at peace now and not suffering any more from that horrible cancer. Nancy, we only met via the 40th. You mentioned that I made you laugh. But, you filled me with warmth.